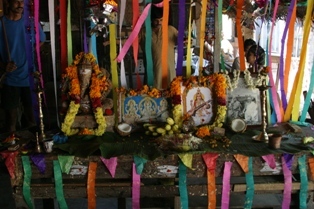 The people of Pondicherry celebrated Ayudha Puja on 8 October 2008, the 9th day of Navaratri (30 September to 9 October this year). Durga puja is called Ayudha puja in the southern states of Tamil Nadu, Karnataka, Kerala and Andhra Pradesh. 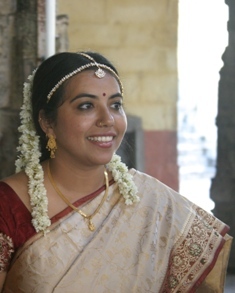 Ayudha puja is “worship of the weapons” – which in common terms is translated into implements and tools. People clean their houses and wash all the implements and tools of their trade, including their vehicles. 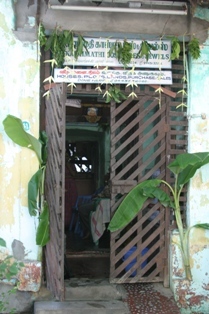 People decorate their homes, offices and other places of work as well as their vehicles with palm and banana leaves. The youngest palm fronds are cut and shaped into decorations. Unfortunately, most people now also use “modern” decorations, including colored crepe paper. Mark and I were invited to two puja celebrations – one at the carpentry and furniture refinishing workshop of a friend (where we had the best food we have had to date in Pondicherry – the carpenters/cooks were from Bihar) and the other at the Shuddham office. On 30 September 2008, C.H. 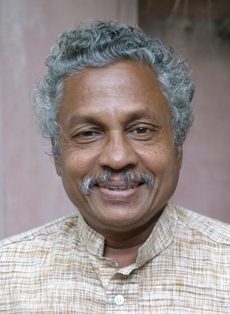 Balamohan retired as an Assistant in the Education Department of the Government of Puducherry (GOP). After 40 years in government service, Balamohan should have been an officer – a Director or at least a Deputy Director of the department. However, his promotions were suppressed by the GOP because of Balamohan’s work on behalf of the government employees – he only had 2 promotions in 40 years. Balamohan is a quiet, unprepossessing person. He suffers from diabetes, at times bed-ridden and unable to walk. 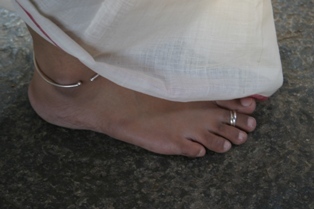 He wears khadi and carries a cloth sachel. He gets around town on a scooter. Yet when he sees any kind of injustice, he becomes a changed man. Put a bullhorn in front of him and he can inspire and rally thousands of people. In 1979, Balamohan began his fight for the rights of the government employees, forming and acting as President of the Ministerial Staff Association (he was part of the Ministerial cadre in the Education Department). From there, he went on to help form other government employee associations in the Education Department, Health Department, etc. At his retirement, he was Honorary President of the Confederation of Pondicherry State Government Employees’ Association, consisting of 100 employee associations.